Globalization Part Two. Our friend Benjie lives in New York City and works for one of the City's finest service agencies. His apartment overlooks Central Park which gives him enough incentive to hike over at any time especially on late evenings. He tells us that nocturnal citizens of the Park would carry with them flashlights all the time for various reasons but importantly for viewing faces of their co-habitues. Out-of-the-blue. Startling. I suppose one gets used to it in time but isn't that quite a courageous posture to cruising. Only in the City that Never Sleeps. From where did the world learn to accept the senseless greeting of "Welcome to McDonald's" while the greeter is attending to another customer at the till. Did anyone feel like responding to the greeting? I initially thought that the greeting of 'Bonjour' in Paris was something similar -- senseless, impersonal, idiotic -- until I bravely talked up some of those who dished out the greeting in hotels, in restaurants, even at the Buddha Bar. If they failed to greet, it meant that they may not have noticed you or (!) they didn't like you at all. Unlike the Americans who are slaves to consumerism, I think that the French are inclined to view themselves as experts in whatever they do regardless of their profession and therefore take their actions (or their opinions) seriously. One time in NYC, I did not have enough loose currency for restaurant tipping that I left only U$10 on the table. The waiter had the temerity to run after me and give back the money because as he said it is less than what was expected. 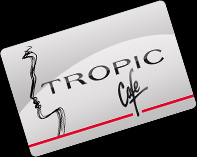 At Paris' Le Tropic bar which is mostly frequented by the young adult gay population, we are never bothered with tips and do not see any apparent interest on the part of the gorgeous waiters to push drinks past your face from time to time. They are nevertheless quick to respond to requests for another glass of kir with the most seductive of smiles. Last year in Hongkong, a pretty senior Anglo-Saxon guy loudly greeted me with "Hi, hi, hi" meeting me through a hallway. Nothing's wrong with that except that we were surely not acquainted with each other. Again, nothing's wrong with a desire to 'pick up' someone in an airport but that was as bold as holding a lit flashlight to a stranger's face. In contrast, I received once from a waiter at the Banana Cafe in Paris a card sent by one customer seated inside [I was at the exterior area] asking if he could join me for drinks. Nothing's wrong with that. Different strokes with different cultures. Tolerable differences which could bring us to World Peace -- if only all differences were tolerable. I cruised the park scene when I was younger, We have nothing like Central Park over here of course but it was quite exhilirating. Hi Nyl - I greet them back but most don't take notice because they're focused na on the next mall rat.